Hanna Cannon of Salon Linnea, with her tattoo of the Aveda mission statement. But how many salon owners have it tattooed on their back? At least one. Hanna Cannon, owner of Salon Linnea in Palmetto, Florida, feels so passionately about Aveda’s mission that she considers it not just part of her career, but part of her life, which is why she had the statement tattooed on her back. Cannon’s path to becoming an Aveda salon owner and Purefessional™ started early. At age 16, she knew exactly what she wanted to do with her life: become a hairdresser. So in the middle of the 10th grade, she dropped out, got her GED, and started shopping for a beauty school. 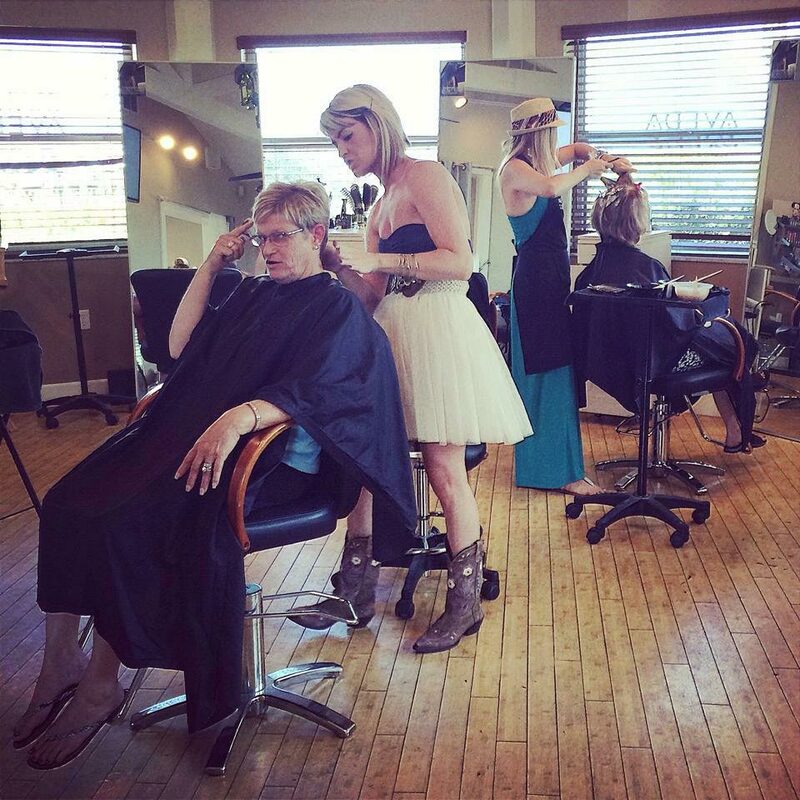 “I first went to check out a local beauty school and was practically traumatized. I knew it wasn’t right and that there was something better,” Cannon says. After consulting with a trusted hairdresser, she enrolled in a local Aveda Institute, and became the youngest person to attend. Nine months later, she graduated and went to work for Nuovo, a prestigious Aveda salon with several locations in the Sarasota area. “The Salon People had also just started and I got to know everyone there on a personal level because they were still small,” Cannon says of her distributor. At Nuovo, Cannon became an assistant colorist and learned so much from the colorist she was working under that she stayed an assistant even longer to continue absorbing information. Soon, Cannon found herself in Los Angeles as a color assistant at Planet Salon, owned by the renowned Ginger Boyle, among many others and returning with invaluable advanced education under her belt. At age 21, Cannon became the first and only hair color Purefessional™, and was teaching every weekend and at big shows all over the country. “I was in salons all the time and owners would ask me to evaluate their teams or help them out in other ways,” she says. Inspired by other owners’ faith in her, at age 22, Cannon opened her first salon. The small Florida town Cannon lives in, Palmetto, seemed like an unlikely spot for an Aveda salon to some, but she knew better. “It’s such a little cow town, but I knew there were a lot of residents who drove to St. Petersburg or Sarasota for Aveda salons,” she says. “So when I found a great existing salon for sale on the water near lots of high-end restaurants, I bought it and turned it into an Aveda salon. With six stylists (all graduates of the Aveda Institute and former students of Cannon’s), one nail tech and two front desk coordinators, Salon Linnea is a boutique business. But there’s nothing small about Cannon’s growth. The existing salon Cannon bought had been established for 20 years and grossed $80,000 the year before she bought it. In her first year, she grossed $300,000, tripling the business. After four years in business, she’s now grossing $410,000. Most of her growth is coming through referrals from guests who love the experience they receive at Salon Linnea. But doing business in a small town has its own set of challenges. To combat some of these issues, Cannon and three other local Aveda salons (all about 15 miles apart), have formed a network to help each other. The salons band together to bring in quality education to their staff as well as consult each other in hiring new employees and implementing new best practices. Cannon’s support system also includes her salon development partner, Michael Cragnolin at The Salon People. As her business continues to grow, Cannon remains a Purefessional™ and has her eye on a second location, which she thinks she may have recently found. For other stylists who want to become owners, she advises utilizing the Aveda network to ensure success. Cannon maintains it’s sometimes better to start smaller before tackling a larger location. She recommends anyone wanting to open an Aveda salon to work with Aveda as they have the tools to help analyze if your location will work for you in the long run. If it doesn’t, they can point you to a better spot. Cannon has embraced the guidance and advice she has received from her network of mentors at The Salon People and Aveda for successful results.